Quick and Easy Thai Green Curry Vegetables – fragrant, flavorful and ready in under 30 minutes. Perfect for a weeknight meal. A little spicy, a little sweet, super quick, incredibly easy, kid approved, and crazy delicious! Yup, that perfectly describes this gorgeous Thai Green Curry Vegetables recipe. The whole family loves this one!It’s the perfect balance of sweet and spicy to please big and little tastebuds alike. Take advantage of some grocery store staples to bring the whole thing together in less than 30 minutes. Green curry paste ingredients typically include green chilies, garlic, lemongrass, kaffir lime leaf, shallots, cilantro, and thai basil. The brand I generally buy doesn’t include cilantro or basil, so the green color isn’t as vibrant as others might be. I like to sprinkle chopped cilantro on the dish before serving. And you could certainly add some Thai basil too. I also add turmeric to this recipe which turns it more yellow than green. No matter the color, it’s delicious! Some brands of Green Curry Paste do contain fish or shrimp paste, so read your labels before purchasing. Thai Kitchen brand is both vegan and gluten free! (This post is in no way sponsored by Thai Kitchen, it’s just the brand I like to use). The difference between green and red curry is mainly the variety of pepper used. A few of the spices can be different as well. Typically green curry is spicier than red curry, but it really depends on the brand of curry paste you use. I find the Thai Kitchen brand that I use to be fairly mild. Since our family has two adults and 3 kids, I am always looking for that nice balance of flavor that will please all tastebuds. Three tablespoons of Thai Kitchen Green Curry paste is the perfect amount for our family. It’s gives great flavor, but isn’t overly spicy. The addition of coconut milk and a small dash of sweetener in the recipe helps to tone down the spice level as well. If you are more sensitive to spicy foods, start out with 2 tablespoons and adjust as needed. On the other hand, if you are in the more-spice-more-better camp, then by all means, add an extra tablespoon or two. I will be the first to admit that this Thai Green Curry Vegetable recipe is totally unauthentic. You already know that I use store bought curry paste. And now I’m fessing up that I use a bag of frozen mixed vegetables. I like the one that has corn, green beans, peas, and carrots. Trader Joe’s carries an organic one called the Organic Foursome. I use frozen mixed vegetables in my Easy Minestrone Soup, too, and I go into detail about why I love them in that post. Bottom line – they’re quick, easy, nutritious, and delicious. 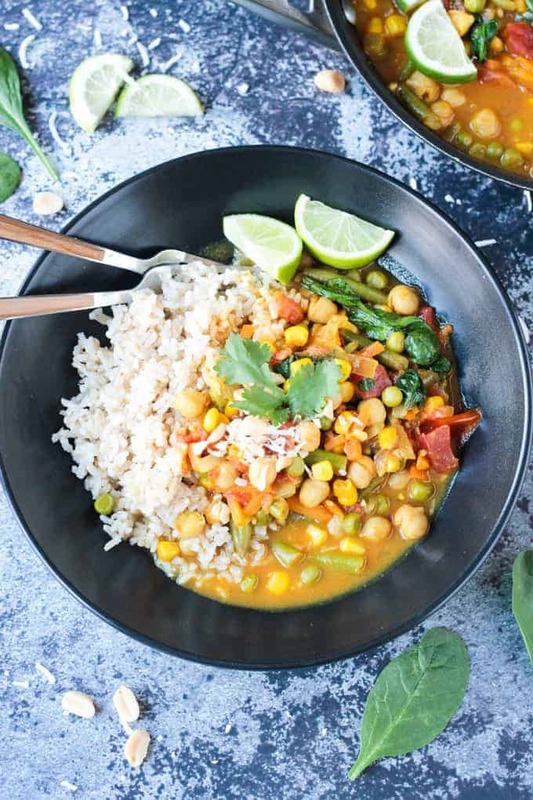 While they might not be the traditional vegetables you’d find in authentic Thai Curry, they work really well here and they allow you to have dinner on the table in less than 30 minutes! Bonus, these are veggies my kids all love. Feel free to add some fresh chopped red bell pepper, broccoli, or zucchini if you desire. All would be great in this dish. Side note: because I’m all about the quick and easy, I almost always pair it with quick cook brown rice. It cooks in just 10 minutes (some brands are even less) and you can easily make that while the curry simmers. 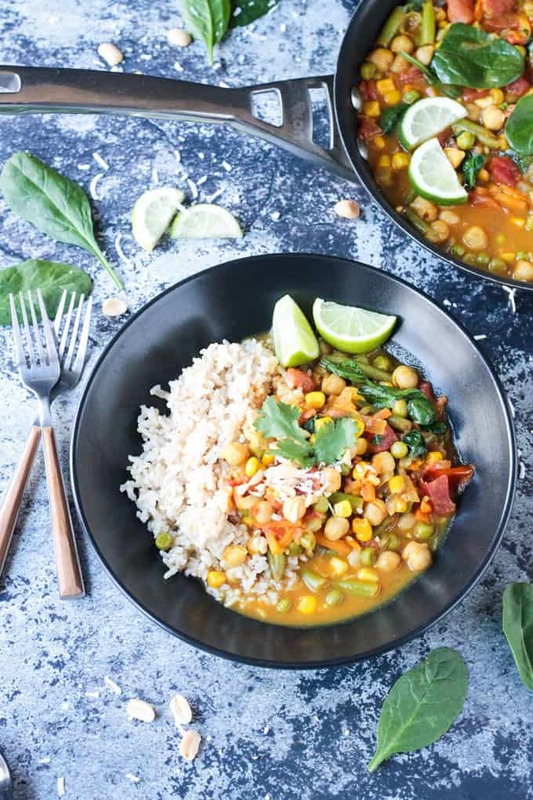 I hope you love these Vegan Thai Green Curry Vegetables as much as we do. If you try it, please come back and leave me a comment below with your feedback and star rating. Quick and Easy Thai Green Curry Vegetables - fragrant, flavorful and ready in under 30 minutes. Perfect for a weeknight meal. Heat 1/4 cup vegetable broth (or 1 tbsp oil) in a large skillet over medium heat. Add the chopped onion and sauté 4-5 minutes until softened. Add the garlic and sauté 1 minute. Add the Thai green curry paste and stir well to incorporate. 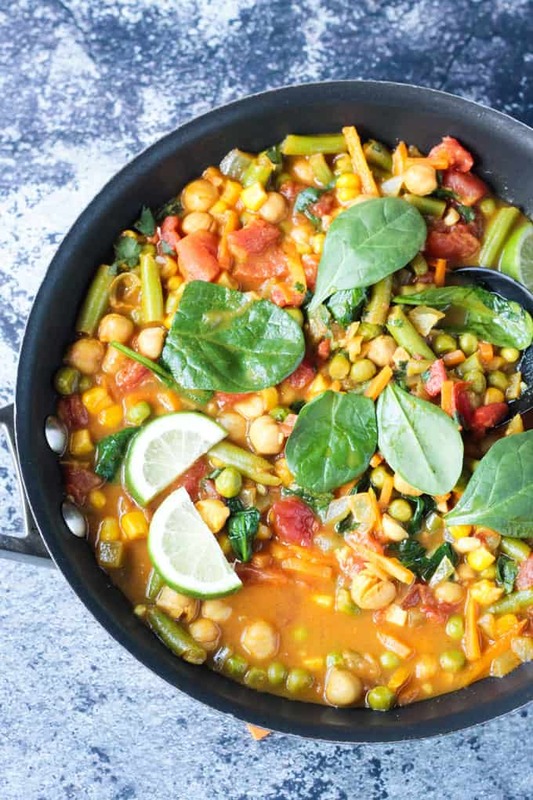 Add the diced tomatoes, coconut milk, salt, turmeric, mixed vegetables, and chickpeas. Stir to combine. Raise heat to bring to a low boil, then turn down heat to medium-low and simmer for 15 minutes. Add a squeeze of fresh lime juice (about 1/4 of a lime) and stir. Optional: If you want a thinner sauce, add 1/4-1/2 cup of vegetable broth. Right before serving, stir in a handful of fresh spinach. For serving: garnish with chopped cilantro and chopped peanuts, if desired, and serve with cooked rice or noodles. *I use Thai Kitchen Thai Green Curry Paste. It is fairly mild with just a hint of heat. 3 tbsp is the perfect amount of flavor/heat for my kids (which do like spicy foods). I can't vouch for any other brands, which may be spicier. If you use a different brand, proceed with caution...especially if you are feeding children. Start with just 1-2 tbsp and add more after tasting. ~Nutrition facts calculated for vegetables only. This does not include any rice or noodles for serving. 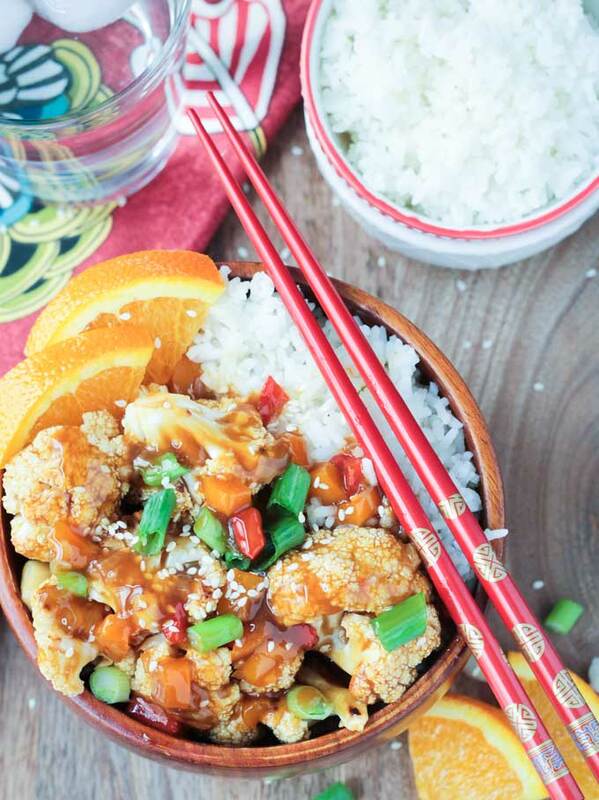 We LOVE Thai food and this recipe looks terrific. Thanks for the inspiration! Thanks, Terri! I hope you love it. Enjoy! What a healthy and tasty looking weeknight meal and ready in under 30 min – even better! Green Curry is one of my favourite Thai dishes! Beautiful photos. No shame in using good quality prepared or frozen ingredients. It just makes it that much easier to put a tasty and satisfying dish on the table for your family! YES, absolutely this! And thank you! 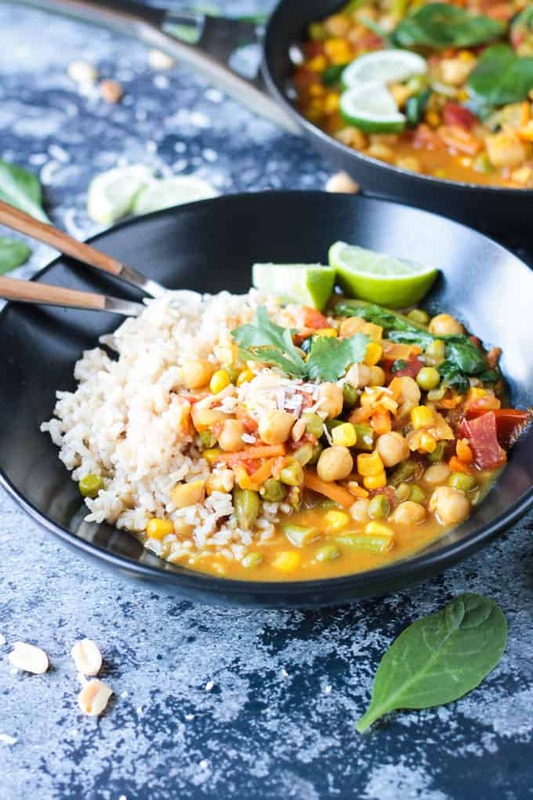 Love your use of frozen veggies in this flavor packed curry. They are often my go-to too! 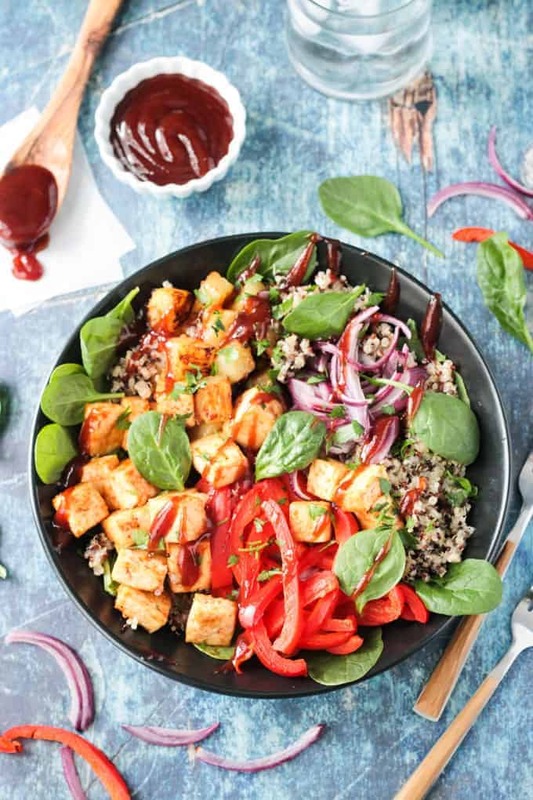 Such a time saver and just as delicious! Thanks, Shashi! My husband loves Thai food. I will have to make this recipe for him! Excellent. I hope you both love it! 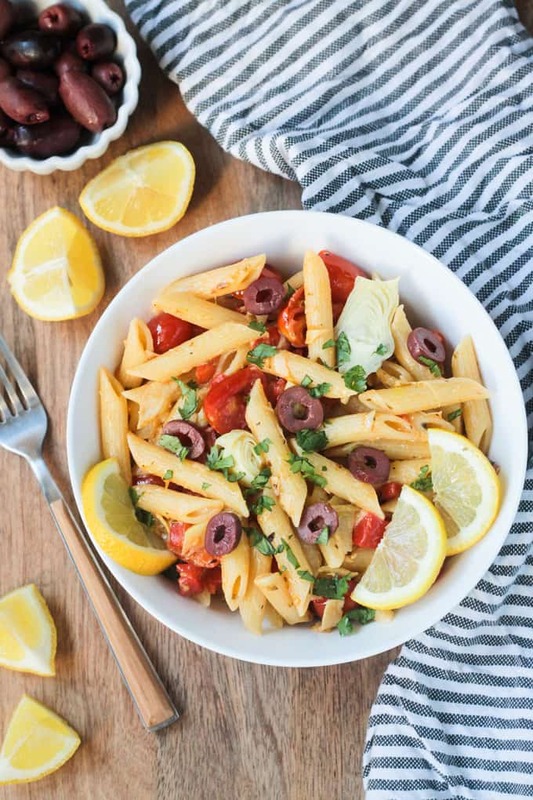 I absolutely love this for a healthy, quick weeknight meal! And I, for one, am all about using the frozen veggies – so much better than having to chop so much that you kind of want to give up on the whole thing! Yes, gotta take those shortcuts when you can! Thanks, Monica!